After a critically acclaimed run at Chichester Festival Theatre, Daniel Evans’ production of James Graham’s five-star play Quiz transfers to the West End. Playing a limited season at the Noel Coward Theatre, the production follows Graham’s stellar play Labour of Love, which also ran at the London venue. Based on the infamous scandal of ‘coughing Major’ Charles Ingram, who cheated his way to the top on Chris Tarrant’s Who Wants to Be a Millionaire?, Quiz takes a close look at Britain’s love for television quiz shows. How did he manage to get away with it and win the top prize? And what were the consequences? Gavin Spokes (Guys and Dolls, Carousel) stars as Charles Ingram, alongside Keir Charles (The Lottery of Love, A Christmas Carol) as host Chris Tarrant and Stephanie Street as Charles’ wife Diana Ingram. Further casting includes Greg Haiste, Mark Meadows, Henry Pettigrew, Jay Villiers, Lizzie Winkler, Sarah Woodward and Sharon Ballard. Directed by Chichester’s Artistic Director Daniel Evans, who has helmed award-winning productions Flowers for Mrs Harris and Show Boat, Quiz features choreography by Naomi Said, design by Robert Jones, lighting design by Tim Lutkin and sound design by Ben and Max Ringham, with video design by Tim Reid. Quiz is written by James Graham, who has taken over the West End with his political plays, including This House, which returned to the Garrick Theatre, whilst Rupert Murdoch play Ink played a limited season at the Duke of York’s Theatre. Labour of Love, starring Tamsin Greig and Martin Freeman also played a limited season at the Noel Coward. 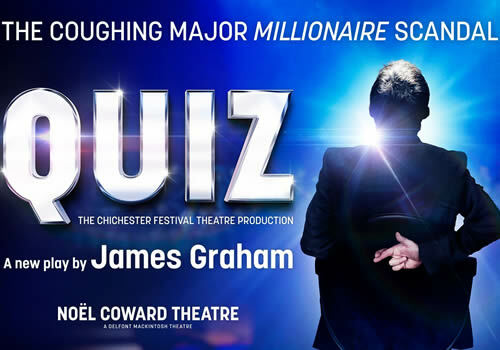 A show that offers a unique gameshow-meets-theatre concept, Quiz transfers to the Noel Coward Theatre for a strictly limited season. The production plays from March 31st to June 16th 2018, with an official opening on April 10th 2018. Quiz is suitable for all ages, but not recommended for children.